This unique designer three stone blue sapphire ring is accented by 74 brilliant cut round diamonds. 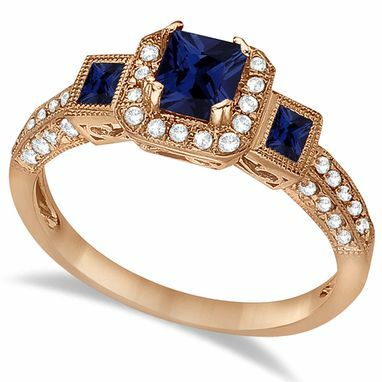 This engagement ring features three stones, a 4x4mm princess shaped blue sapphire and two smaller 2x3mm emerald cut blue sapphires. 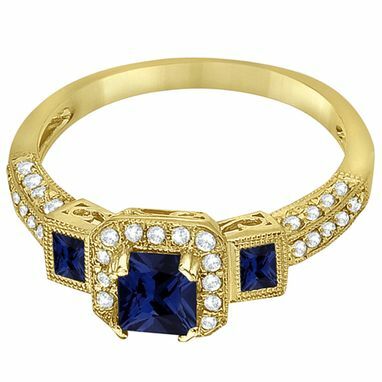 This gemstone ring features a rim-accented design with prong set diamonds showcased on both sides of the band as well as at the top. 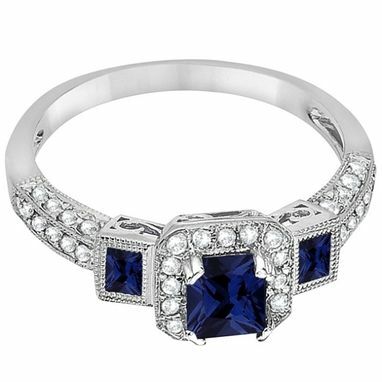 The diamonds that accent the sapphires in a halo fashion are of G-H Color and SI Clarity. The genuine September Birthstone gems and diamonds are set in a vintage style milgrain edged 14k gold setting. Customize this engagement ring in any 14k gold metal setting.